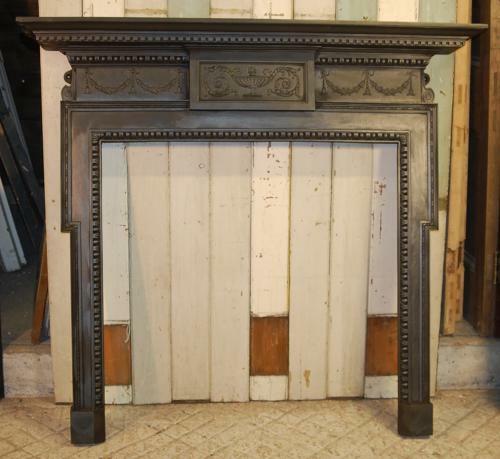 A stunning cast iron fire surround, one of 2 available, see FS0029. The fires are Edwardian and of Neo Georigian design. Each fire is almost identical, with the same highly decorative, Adam Style design, featuring a large urn, pretty swags and leaves and the fire opening has an egg and dart style border. The fire has a heavy mantel and fixing lugs on either side. The sides of the fire are designed to stand proud from the wall. It has a fantastic finish and has been blacked and polished to a very high standard. Both fires have very fine detailing and are of a wonderful quality. Each fire is very heavy and large, perfect for a living or dining room. The fires are antique and although they are in fantastic condition, there are some slight signs of wear. The fires both have some small casting marks and very light scratches. One fire has a very well repaired fixing lug. The other fire has a large lined casting mark on the top left hand side. The backs of the fires have surface rust, as expected. The fires are of the same measurements, listed below. Both fires are a stunning example of Neo Georgian design and would add great style and interest to a period home.